Create a chart of data using HTML table elements. We’re going to walk through taking some information and converting it into a data chart using HTML table elements & tags. Start the lesson by forking and cloning the data-table repository. Fork & clone the “data-table” repo. To save some time with this lesson I’ve set up some basic files and put some basic content into the HTML that we’ll work from. This repo has the HTML boilerplate and all the CSS files hooked up. The content we’ll need is already inside the index.html we just have to wrap it in the right tags. Let’s start the data table by creating the header row with the labels for each column. Everything about a data table needs be wrapped by the <table> tag. The border="1" is a temporary attribute we’ll add to see all the edges of the cells. This must be removed from the final table—it’s really just a development tool. We’ll close <table> later when we get to the bottom of the information. Think of the <caption> tag as being like an alt="" attribute for images. It’s a summary of the information found in the table. Unlike an alt="" attribute though, the <caption> is always visible—and should always be visible. The <thead> tag defines a series of rows as being the header of the table. The <tr> element defines a row within the table. The <th> tag is used to create a cell, a specialized cell, a heading cell. The scope="col" attribute tells the browser and accessibility tools that this heading labels the column. The next step is to create the five rows of data for our table. 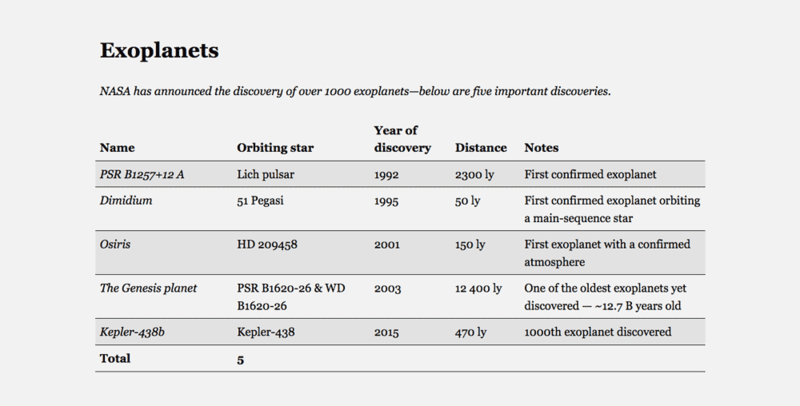 Each row will represent all the information for a single exoplanet. The remaining 4 rows are up to you. 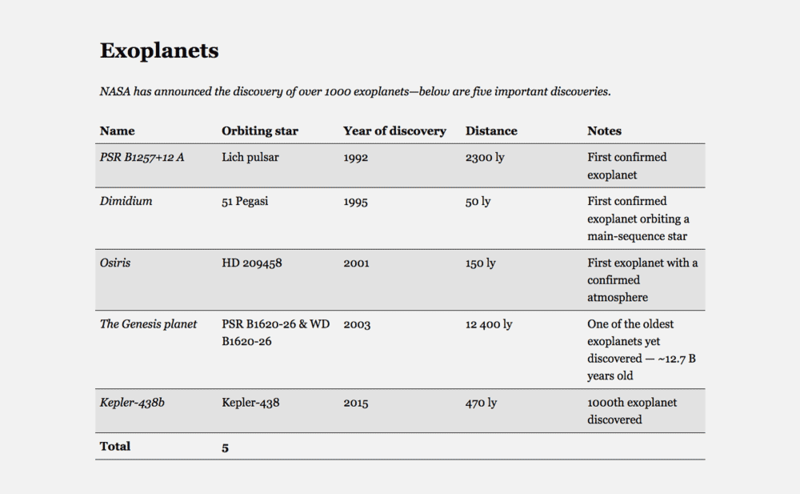 Copy and paste the above row and populate it with the information for the rest of the exoplanets. The <tbody> tag is used to wrap around the rows of the data table that represent the primary information. Each row starts with the <tr> tag to define the row of information. The first cell of each row is a <th> tag to denote a heading for the whole row. Notice that it’s scope is set to scope="row" to define that it’s a heading for the row. The rest of the data sits in basic <td> tags. To finish off the <table> we’re going to put in the footer information: the totals, etc. Now that we’ve got all the <table> tags and data in place we can check it out in the browser. Notice of the total planets cell is stretching across four columns because of the colspan="4" attribute. Don’t forget to close the </tbody> tag! The <tfoot> is the final row grouping tag, it’s to define rows of a table that are totals and extra information. Another row heading for this row. Notice the colspan="4" attribute on this <td>. I don’t want to put a bunch of blank cells across the row because every row must have the same number of cells. Don’t forget to add the closing the </tfoot> and </table> tags. Now that we’re happy with the layout of the rows and columns & everything looks good we must remove the border="1" attribute. The default look of tables is pretty abysmal—Typographier has some slightly nicer table defaults, do let’s add that code into your website. We’re not using a grid for this lesson so it doesn’t need to be included. Admittedly though, things are still a little whacky—we’ll fix it next. Now that we have access to Typografier, let’s add some of those classes onto things. Let’s style a little bit of the typography in the table’s body rows to make it a little more pleasing. And finally we’ll make the footer of the table completely bold. Add some gutters and padding to the <main> tag. Add .wrapper to the <div> to contain everything to a nice size. Let’s maake the caption a little bigger so it stands out from the rest of the text, using the .mega class. Let’s open up our main.css and add one more custom style to the table: “zebra striping”. This will select every odd-numbered row in the table and add a background colour—making it easier to separate the rows visually. This is called “zebra striping”. Tables automatically layout based on the content inside, but it doesn’t always create an optimal width for the columns of text. So let’s add some widths to the columns to make it better. Now add the widths into our CSS. The widths for each of the columns aren’t some magic numbers—I just used the developer tools to change the width of the columns until I found a layout that looked nice to my eyes. Add a new class to each of the <th> tags so we can distinguish them in our CSS. Well, we’re going to go with the horizontally scrollable table. It’s simple to implement and has okay user experience, but not as optimized as some of the other solutions. First we’ll surround the table in a new <div>. Further down the page, don’t forget to add the closing </div> tag. Now a little bit of CSS to finish the responsiveness off. Now when we shrink the screen down we should be able to scroll horizontally. .table-wrapper — just made that up right now. .scrollable — a class from Modulifier that adds horizontal scrollbars when necessary. Don’t abuse this class—it’s very, very nasty. First we disallow the <table> from getting narrower than looks good. This isn’t a magic number—I just used the developer tools to make the screen narrow until the table started to look awkward, took the pixel width and divided by 16 to get ems. Force the horizontal scrollbar to be permanently off at the large screen size.